Known as the 'queen of prints', Irish designer Orla Kiely launched her namesake label in 1995. Originally beginning as a creative medium in which to express her love of colour, graphic and texture, the label is widely acclaimed throughout the world for its vintage and retro-inspired prints and seventies-style tones. 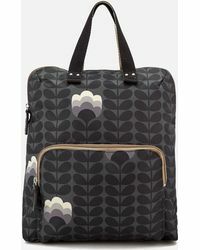 Orla Kiely backpacks celebrate the iconic print that this designer does so well, as well as adding a forthright functional twist. Finding form in a variety of roomy tote styles, Orla Kiely backpacks deliver subdued tones, an unusual silhouette and a picture-perfect finish in a faultless mix of the nostalgic with the modern.